LONDON – February 6th, 2018 - SEGA® Europe Ltd. and The Tetris Company, LLC are pleased to announce that the fast-paced, competitive party game mash-up, Puyo Puyo™ Tetris® will launch on Steam for PC, on Tuesday 27th February 2018. Puyo Puyo Tetris sees two puzzle game juggernauts collide as Tetris, one of the top selling video games of all time and one of the most recognized brands in gaming history, and Puyo Puyo from SEGA combine to create a fun-to-play, fast-paced, competitive party game like no other! There are a ton of different styles of gameplay – from the single-player Adventure and Challenge modes to the ferocious competition of the up-to-four-player Arcade modes. You can even take your puzzle skills online in the Puzzle League or Free Play multiplayer modes with up to four players. Play through Adventure mode to unlock new characters and backgrounds, and visit the in-game Shop which enables players to unlock new character voices and skins for Puyos and Tetriminos. For those wanting to get in on the frantic puzzle action early, pre-order Puyo Puyo Tetris on Steam or other SEGA approved digital retailers* before 27th February and receive exclusive wallpapers and avatars featuring your favorite Puyo Puyo and Tetris characters. Pre-ordering through Steam will also net fans an additional 10% discount. 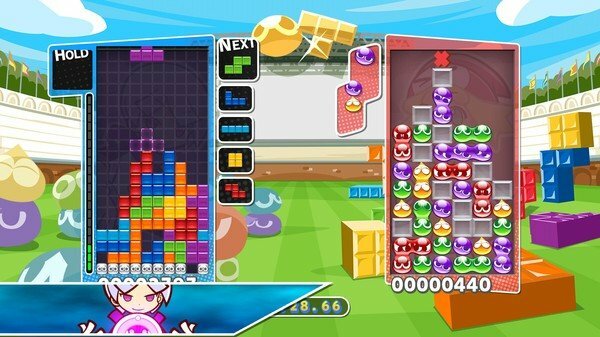 Puyo Puyo Tetris is the latest best practice PC conversion from SEGA and boasts PC exclusive enhanced features including scalable resolutions, fully customizable controls and mouse-driven menus. As an added bonus and for the first time in the West, players of the new PC version have the option to enjoy the game’s original Japanese voiceovers. Puyo Puyo Tetris adds to the ever-growing list of best practice PC conversions from SEGA and joins critically acclaimed titles such as Vanquish™, Bayonetta™ and Valkyria Chronicles™. For more information on SEGA and any of its products, please visit www.sega.co.uk. You can also follow us on Twitter and like us on Facebook. SEGA Europe Ltd. is the European Distribution arm of Tokyo, Japan-based SEGA Games Co., Ltd., a worldwide leader in interactive entertainment both inside and outside the home. The company develops and distributes interactive entertainment software products for a variety of hardware platforms including PC, wireless devices, and those manufactured by Nintendo, Microsoft and Sony Interactive Entertainment Europe. SEGA wholly owns the video game development studios Creative Assembly, Relic Entertainment, Amplitude Studios, Sports Interactive and Hardlight. SEGA Europe’s website is located at www.sega.co.uk. PUYO PUYO™ was first introduced in 1991 as a puzzle game with intuitive game play and easy to grasp rules, where players match 4 of the same kind of colorful "PUYO" pieces that drop from above to make them disappear. Its cute characters and introduction of the "vs. battle" to the genre for the first time made PUYO PUYO a smash hit in Japan and many other countries. The PUYO PUYO series continues to expand to a variety of platforms, from consoles to mobile apps. PUYO PUYO™ Tetris® is a collaboration with Tetris®, the world-famous action puzzle game.